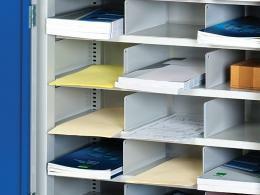 Whether you need to store paper, boxes of material, or smaller equipment, these steel cupboards with compartment dividers make storing and organising easy and fast. Each compartment measures a consistent 235mm in width, 310mm in depth, and are 100mm tall. What is The Purpose of the Steel Cupboards with Compartment Dividers? 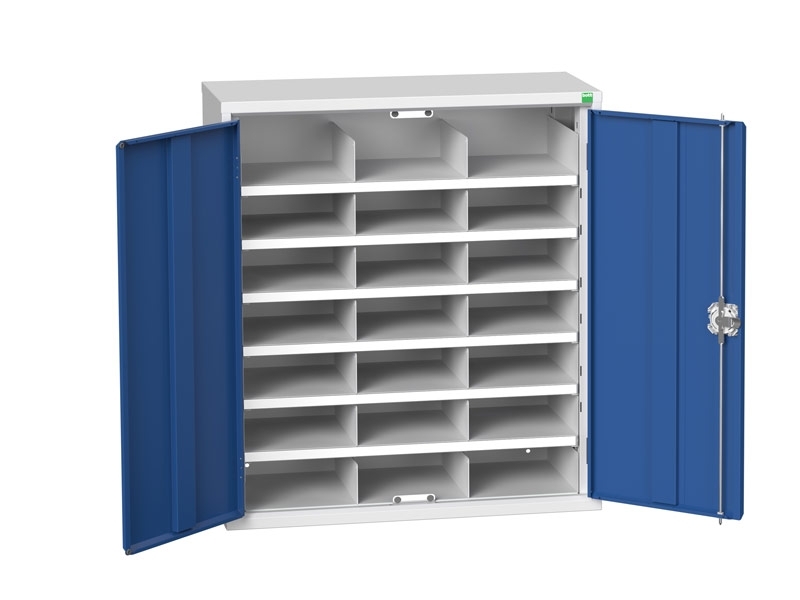 With a three point locking system and reinforced doors, these steel cupboards with compartment dividers are perfect for storing and organising even your most sensitive assets, and you can be confident that they’re protected, even when you’re away. Each shelf can support up to 60kg of total weight, making them highly capable of holding heavy boxes of equipment or materials. If you need to securely store small or easily lost tools, materials, or parts, these steel cupboards with compartment dividers are the perfect addition for your work space. 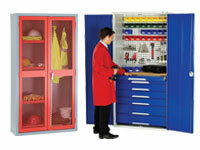 Ideal in schools for paper, testing materials, or projects, these cupboards are a safe and lockable storage solution. Use in workshops to hold small and easy to lose parts or tools, with a separate compartment for each one. Or utilise to separate equipment and materials by project, and make sure that you never misplace an important part again. Whether you need a place to store reams of paper, projects, or supplies safely and securely, or want to organize your workspace to suit your needs, these steel cupboards with compartment dividers will make storage an easy and efficient task. Reinforced doors with three point locking system and industrial steel body Full ten year warranty.